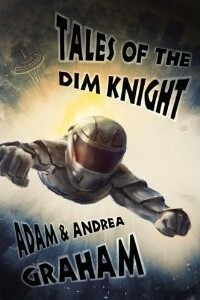 Both play a role in Adam and Andrea Graham’s speculative novel, Tales of the Dim Knight. I focus primarily on the fantasy end of the speculative fiction spectrum, but when Adam made himself available for interviews about his superhero spoof, I took the opportunity to ask him a few questions about his novel and his writing process. What do you see as the value of humor in fiction? Laughter is a great ministry. Using humor is a good way to combat the speculative writer’s greatest weakness: the temptation for world-building to trump everything. If you have good humor throughout a story, it ensures you will appeal to the human side of your readers and not simply pay a lot tribute to all the machines, planets, and alien races you can think of. What drew you to the superhero sub-genre of speculative fiction? Popular Superhero fiction may be the most naturally Judeo-Christian form of speculative fiction. This is not usually true of the comic book industry, which has tended towards a darker, post-modern mood. However, a relatively small audience sees comic books compared to the masses that film and television reach. Film audiences tend to want superheroes to do the right thing and to embody things like justice and self-sacrifice. Movies such as the Spider-man trilogy succeeded because they spoke to these things, others that have gone post-modern, such as The Watchmen, haven’t done nearly as well. Not all superheroes are exemplary of Christian values, but the world of superheroes for most people is defined by moral absolutes, which makes it a good fit. I have two speeds for my writing: plodding and plotting. When I’m plodding, I’m usually working out a few hundred words a day on my work in progress. When I’m really into full plotting mode, I eliminate all distractions and type relentlessly, ignoring little things like typos and description as I zoom through the novel, focusing on creating my plot. Other things can be added, but the core of my book to me is always getting the basic story down. Adam will stop by today and answer any questions left in the comments, so if you’re curious about the book, ask away! Mild-mannered janitor and superhero fanboy Dave Johnson gets all his wishes at once when a symbiotic alien gives him supernatural powers, but what’s he to do with them? Follow his zany adventures as he fights crime and corruption while trying to keep his family together and avoid being sued for copyright infringement. Adam Graham is a multi-talented author known for his wit and poignancy. His political column appears on Pajamasmedia.com and Renew America. He also has short stories published in the anthology Light at the Edge of Darkness, and in the Laser & Sword e-zine. He tweets at @idahoguy, @dimknight and @radiodetectives. This entry was posted in Christian Fantasy and tagged Adam Graham, interview. Bookmark the permalink. I’m wondering if you can assist me in locating the title of a book involving an accidental symbiotic relationship between a human and a alien. It ultimately causes the human to be immortal.? Walt, unfortunately that storyline doesn’t sound familiar to me. I wonder if it could be the book Lisa suggested? I hope you can find it! You might be talking about Needle, by Hal Clement. Good book.